Throughout the course of the 12 Week Certificate, students are exposed to the wonderful world of wine through a series of lectures and tastings, delivered by Colm McCan, Head Sommelier at Ballymaloe House. Wine lectures are typically conducted on Wednesdays and students are introduced to the major wine regions of the world, with a particular focus on organic and biodynamically produced wines from ethical producers. Guest speakers are invited to speak to the students, from wine merchants to vignerons to wine writers. The Week 12 Final Exams include an in-depth wine examination which will put students to the test on a wide spectrum of wine information, including food and wine pairing. Students also typically have the opportunity to attend wine events at Ballymaloe Cookery School or at Ballymaloe House during the course of their studies. 2014 recipient of the Food & Wine Magazine 'Sommelier of the Year Award', Colm McCan grew up in Tipperary in the family guesthouse business, a listed historic property with a 250 year old wine cellar, so it's no surprise that Colm has been interested in all things wine-related since then. Following completion of studies including a Diploma in Business Management (Hotel & Catering Management) at GMIT, and wine studies undertaken with the WSET, Colm has worked in high profile hotels and restaurants, both in Ireland and overseas for the past 25 years, joining Ballymaloe House in 1995 as Head Sommelier - a position that has won him much praise from patrons and peers alike. 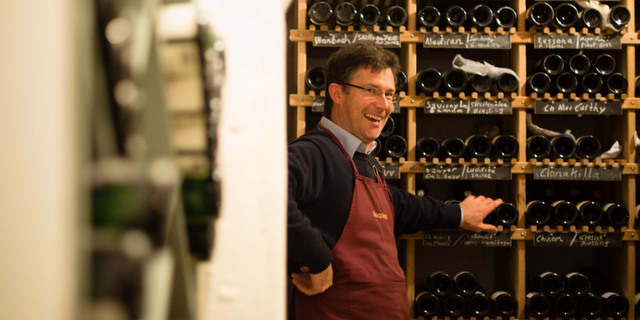 Wine Spectator Award of Excellence - "One of the best restaurant wine lists in the world"
Colm is our Wine Lecturer here at Ballymaloe Cookery School, and delivers a wine education programme for our 12 Week Certificate students three times yearly since 2006. Welcoming national and international wine experts on a regular basis in person to the cookery school, he also participates in live streaming international tastings and virtual wine events, all culminating in a wine exam for the students at the end of their course. Colm introduced the first electronic wine list in the world, with dedicated winemaker video-clips, made specifically for Ballymaloe. At the time, this received global recognition, including The Wall Street Journal, The Drinks Business, The Financial Times, The Sommelier Journal of America, and many other printed and online media including JancisRobinson.com. When not in the depths of the cellar, Colm can be found in the first East Cork vineyard right here at Ballymaloe Cookery School.